Development of marine spatial plans for Dorset (England) and Heist (Belgium) and associated materials such as a comprehensive seabed map for Dorset and numerous background studies, studies on tourism and a long term vision for Heist. How do we best ensure integration between terrestrial and marine planning? What is the relationship between marine spatial planning (MSP) and ICZM? The local political context and governance regarding marine development influenced the project and the type of marine plans which emerged. The main aim of the Belgian plan was to establish a spatial vision for the future use and development of the beach and the marine area, in order to address their major single issue at the land-sea interface: the growth of the offshore sandbank, and its effects on the local economy. The political situation also prompted the decision to establish an expert group to drive the marine planning agenda forward in Belgium which acted to assess state of MSP in Belgium and influence federal government via a position paper on MSP in Belgium. 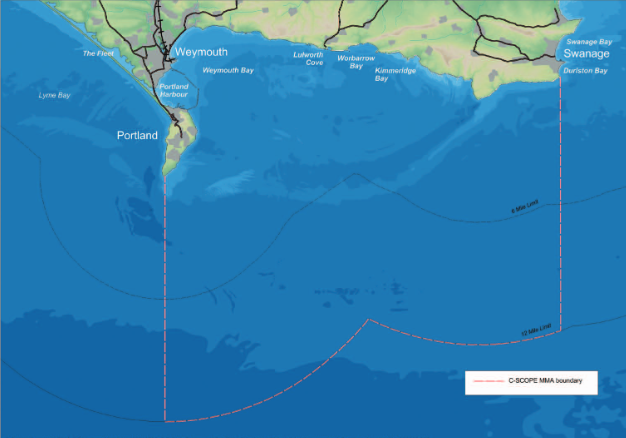 In Dorset the C-SCOPE project was initiated before the UK Marine and Coastal Access Act had been given royal assent, although it was clear that marine planning would focus on sustainable marine development, Offshore wind development within the MMA was also a strong possibility and the global economic downturn had started to have an impact in Dorset which consequently reinforced the decision to develop a marine plan for sustainable development. The Dorset MMA therefore served as an unofficial pilot for national marine planning. Produce a framework for an integrated approach to land and sea planning and management. Provide practical case studies of integrating across the land-sea interface. Develop comprehensive information resources to underpin sustainable coastal management. Provide a test case for implementation of the principles of MSP in the EU. Each partner selected a Marine Management Are (MMA) at different scales which represented a range of habitats, activities and potential conflicts to act as a pilot study. 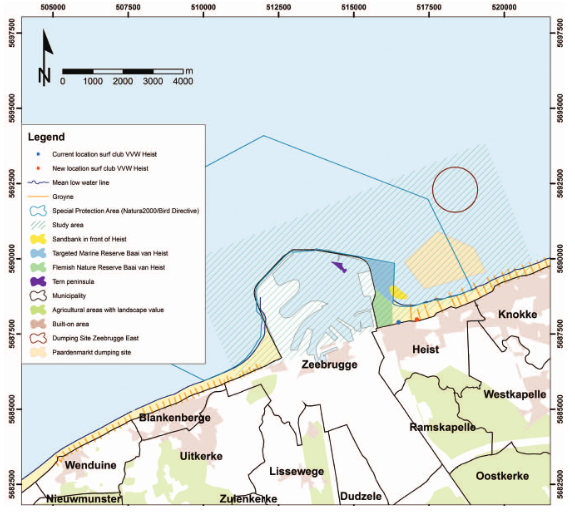 The Belgian partners chose an area covering 47km2 within the Bay, between the West side of the Port of Zeebrugge and the beach of Duinbergen, called Knokke-Heiste MMA. The Dorset MMA is representative of the lower levels of development and competition for space in the UK, compared to Belgium. It covers 953km2 and includes the urban and industrial areas of Weymouth and Portland including the Port as well as the rural Purbeck coastline. The inland limit was undefined to ensure all relevant data and issues were included in the marine plan. A comparison of the different contexts and features of the MMAs is provided in the table below (presented in the final report of the project). exists in some areas and is increasing, but still many undeveloped areas at sea and on the coast. Belgian EEZ covers 3457km2, with 65km of coastline. Intense competition for marine resources and land space which is scarce. Extensive data collection was undertaken to inform the full CSCOPE project, including review of existing spatial data, commissioning of new studies where gaps were identified, baseline inventory on current conflicts and issues (through stakeholder interviews, etc.) among others. Of particular relevance to the objective of this project (integrating across the land-sea interface) relevant plans and policies applying to this area were collated and reviewed to ensure compliance. Pilot marine plans were developed for both areas, with a number of studies and analysis completed to fulfil the overall objectives of the CSCOPE project. The pilot projects provide a number of lessons which are applicable in other planning contexts. Much of the character of the projects were related to the prevalent conditions and issues faced in that particular settings, however the experience provides useful reference material for the development of MSP in general, particularly relating to the complex issues of land-sea integration. The major lessons were that this integration remains a challenge, with issues faced in co-ordinating between marine and terrestrial planners, particularly in aspects such as agricultural and urban run-off, terrestrial landfall of offshore developments, land-based infrastructure to support ports, and coastal town regeneration. The governance and planning regimes tend to be different, and the lack of consistency and different responsibilities / authorities across the land and sea make coherent planning challenging. Early engagement between marine and terrestrial planners is seen as important in order to develop common understanding and bridge the gap. Additionally, synchronising the timing of terrestrial and marine planning and review periods would also increase consistency.